Buy Race for the Galaxy and PriceWatch, Buy this board game at the Lowest Price. 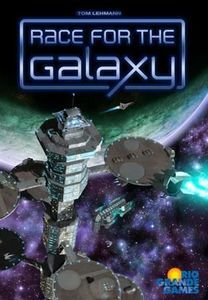 Race for the Galaxy was designed by Thomas Lehmann and released in 2007. It is a card game with the theme of space exploration and conquest. Players take on the role of galactic civilizations trying to conquer and claim new worlds in the galactic fringe. The game has met with resounding critical acclaim, earning awards and "best card game" status from gaming magazines and review websites. Players build huge galactic civilizations using game cards that represent worlds or technical and social developments. Be the most powerful civilization by developing new technologies, exploring and settling new worlds, and producing and trading resources. Time is limited and it is a race to see which civilization achieves dominance the fastest! The core mechanic of the game is having a set of actions that players can choose each turn, allowing all players to take that action but giving the player who chose the action extra benefits. This mechanic is similar to other Eurogames but with a unique twist. In games such as Puerto Rico, once a player chooses an action, other players are not allowed to choose the same action again until the next turn. In Race for the Galaxy, all players can choose any action they want. They do it in secret and reveal the actions simultaneously at the start of each turn. This can lead to redundant actions and adds a gambling aspect to the action choice. The actions you can take in Race for the Galaxy include exploration (drawing cards), researching developments, settling worlds, producing goods, trading goods for cards, and consuming goods for victory points. The developments and worlds that you play also grant victory points, and the goal of the game is to have the most victory points once any player obtains 12 developments and/or worlds. Each of the cards that you can play – either developments or worlds – have abilities that can boost your civilization's power. Example abilities include drawing extra cards while exploring, or letting you settle worlds at a discount. The challenge is therefore to decide which cards should be played first in order to support your overall strategy. As the cards are drawn from a deck, there is a high amount of luck and randomness involved as well. Playing developments and settling civilian worlds require paying their cost by discarding a number of cards from your hand. There will therefore be a lot of cards that you draw that will never get played and instead become discard fodder. There are also military worlds that come into play via a different method: military conquest. You don't have to discard cards to play them, but are required to have enough military power on the cards that you already have in play. The key skill in playing Race for the Galaxy is knowing which actions to play each turn. Should you settle that new world now or trade in resources for more cards first? Performing the most efficient actions in the right order will mean getting your engine churning out victory points the fastest. You will also have to read your opponents, since an action chosen by a player also allows other players to perform it. If you need to settle and produce during a turn, but you know your opponent is most likely to produce, then you can safely choose the settle action and end up being able to perform both actions. The game sometimes feels like it has little player interaction, since each player is busy focusing on creating their own victory point engine. The designers have remedied this by introducing new interactive concepts in the expansions. The Gathering Storm expansion adds both speed and long term goals to strive for, and the Rebel Vs Imperium expansion adds the ability for players to directly attack each other and steal each other's cards. The new Brink of War expansion has also been released in early 2010, and introduces a new resource and path to victory using prestige. Race for the Galaxy is a fast-paced card game, with games seldom lasting over an hour. It is also fairly easy to teach to new players, though its use of icons and symbols rather than text to explain card effects can be daunting (but that's why they have reference cards). Its replay value is very high as well, since the amount of cards drawn and discarded means no two games will be the same. In all, a great game if you have a spare hour to take part in galactic conquest.